Take their inability to get famous volcanoes right. Not to mention their myths about medicine. Like many people, they use erupting volcanoes as a metaphor for holding things in until you explode. Racer relates the story of how a boy at school offended him once, and he said nothing, but brooded. He worked himself into such a lather that he didn’t turn the other cheek when the boy offended him a second time. (Don’t worry – there was forgiveness all round afterward, even from God hisownself!) Racer’s dad, apparently a true believer in folktales about disease, solemnly informs him that holding in anger causes diseases like toxic goiter (nope), and ulcers (wrongo), and heart problems (well, I suppose one outta three ain’t bad). Then he equates the damage angry people cause with the devastation caused by volcanoes. Like Tambora. Which he then proceeds to bork. Tambora’s eruption was huge, yes, but not 150 km³ of material big. Upper estimates are 50 km³ – some put the total as low as 30 km³. The caldera (not crater!) it left is big, but not 11 km – try 6-7 km wide. Weirdly, after exaggerating everything else, they get the height too short by nearly 1000 feet: Tambora lost 4,921 feet off its top, not 4,000. As far as their claim that “A tremendous amount of pressure, over 46,000,000 pounds per square inch (3,000,000 kg/cm²), caused the Tambora eruption,” they seem to have pulled this from their asses. I can’t find that figure anywhere, not even on creationist sites. I’d march into their offices and demand they show me their sources, but I’m not willing to inspect some dude’s sphincter. Mr. Wheeler, who knows bupkiss about ocean floor sediments, then chimes in to tell us that “Subterranean magma is under tremendous pressure because of the heat coming up from Earth’s mantle.” Yes, he doesn’t seem to realize magma is under pressure from the confining strata surrounding it and dissolved gasses within it. It’s not mantle heat forcing it upward: it’s bloody molten rock, it’s plenty hot enough on its own, and it migrates upward because of its lower density. Being all hot and molten means it’s more buoyant than the cold, dense country rock around it. He’s also confused about the anatomy of a volcano: magma isn’t traveling up a pipe, it’s going through a conduit to a vent on the surface. Basic stuff any volcano diagram explains – and, oddly, the ACE writer putting wooden exposition in Mr. Wheeler’s mouth knows the terminology for dikes, veins, and sills, so I know they’re capable of looking this stuff up. Of course, they can parrot a few facts they found somewhere, but they don’t seem to know what this stuff actually looks like in the real world. Dikes, they tell us, “resemble a thick tree trunk sticking up out of the ground” when the surrounding sediments are worn away. They actually look more like walls – it’s volcanic necks that may sorta-kinda look like tree trunks if you close one eye and squint real hard. All this, of course, gives Mr. Loyalton a biblical tingle in his trousers, and he informs us such talk reminds him of Paul’s thorn-in-the-flesh, which God refused to remove. (II Cor. 12:8,9). Racer proves he’s becoming a perfect little godbot by finishing Daddy’s dubious comparison: “Just as the magma formed a hard igneous rock when it cooled in the weak places in earth’s crust, God sometimes allows things to happen in the weak areas of our lives to show His strength.” That’s correct, Racer: your god is a sadistic fucker who likes to torment people at their most vulnerable. Exactly right. Before we end this little sermon and pass on to yet more nonsense about Mount St. Helens, let us explore the ways in which their further “Facts From Science” are not actually factual. For instance, in the Etna box, we’re informed that “valuable fertilizers such as potassium nitrate and various phosphates are found in the volcanic ash that is blown out of the volcano.” I’d love to see the scientific paper that gem came from, because I couldn’t find a single source that says Etna’s ash contains any such things. I did learn a bit about those two salts. Potassium nitrate is the mineral niter, which seems to mostly occur as an evaporate deposit on cave walls. Phosphate in the form of apatite can be present in volcanic ash, granted – but most soils derived from ash need some time and modification to be productive. 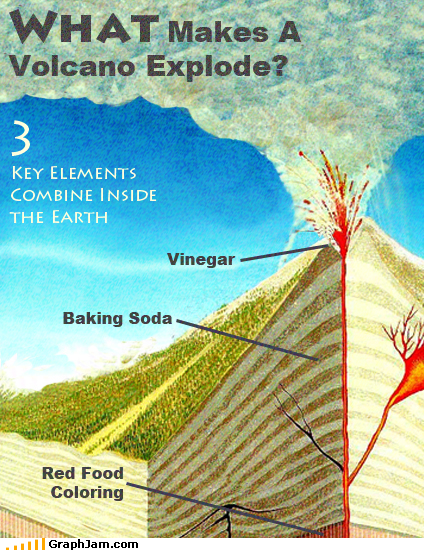 The volcano isn’t erupting ready-made free fertilizer, as this “fact” box implies. Volcanic ash is not bloody Miracle-Gro. ACE’s fact box about Mauna Loa would have us believe it erupts every 3.5 years. The actual average is about every 6, but it varies depending on which timespan you select. I have no idea why they think the average is 1 eruption per 3.5 years since 1950. Including the 1950 eruption and concluding with the first publication of this PACE in 1986, it’s only erupted 3 times in 36 years. That’s an actual average of every 12 years. I guess their average is an example of creationist math. IF THE DOME IS GROWING, THE VOLCANO >IS< ERUPTING. It is actively erupting. That is why the dome is growing. DOMES DO NOT GROW IF THE VOLCANO ISN’T ACTUALLY ERUPTING. Don’t make me talk about the fact they illustrated the concept of a dome by showing a drawing of a volcanic neck. Okay? We’ll get to the remainder of their ignorance about igneous next week. Right now, I am D-U-N done.